With the increasing need to have a sustainable brand and website in this digital age, we are continuously seeing requests for long lasting yet affordable design. However, the question is, how affordable can you go without losing that very important quality? Unfortunately time and time again, we are seeing businesses shutting down potential designers not because of the quality of their work but, because of their rate. how important is your business success? There are many web, branding and design studios out there (us being one of them!) and we understand the need for affordability; heck, not everyone can afford everything right off the bat, we get it! 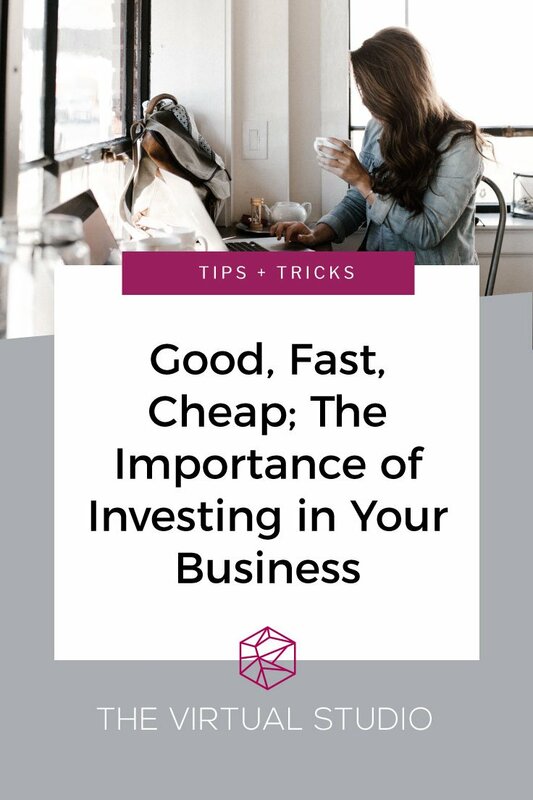 There does however, come a time where you need to truly consider the success of your business and the investments you are willing to make to watch it succeed. Truth be told, after factoring in the time it takes to complete a project from A to Z and not even factoring in the many UN-billable hours we spend on each project, there isn’t much profit left over. The Virtual Studio do what we do because we are passionate, hard-working and love seeing businesses come to life. Ultimately, a designer that is charging a ‘cheap’ rate cannot be spending the necessary time or meticulous detail it takes to create a solid website or design. If they are, then their own business model cannot be sustainable and they will likely soon be out of business. 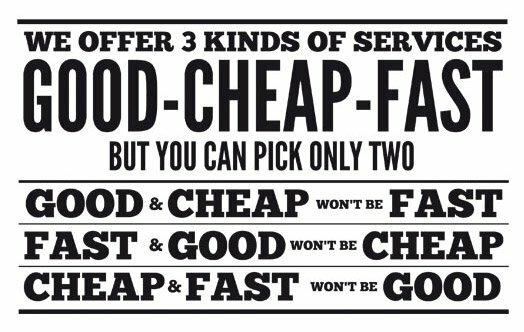 There’s a little rule that many designers go by and that’s the project management triangle – good, fast or cheap. As the client, you are only able to choose two, so which would you choose? Going for something just because it is ‘cheap’ will not produce solid and sustainable results and ultimately will end up causing a ripple effect of having to pay over the odds to correct your no longer working website or dated brand. Next time you are looking to hire a designer just stop and think…would you be happy to take on an in depth project and not be paid your worth for it? Or would you accept half or even a third of the cost of your product? I can guarantee the resounding answer would be a no. Before working with any designer, ask for a consultation first to discuss their processes, turnaround times and what goes into their packages and rates. Any decent designer will be happy enough to explain the process and components included within the quote they’ve sent you and if it sounds too good to be true? Well it probably is! Remember, that in order for your business to succeed and be on the right path, you need to invest in the business yourself. If you are struggling to meet the price that has been quoted then ask the designer if they would be willing to accept a payment plan, retainer or to pay in instalments; The Virtual Studio does believe in being affordable for our clients and will always work with them to sort out a plan of action regarding payment so that you are not left with a big bill at the end of the project. Oh and…ALWAYS get a contract! Ensure there is always a signed contract at the start of every project to ensure the legitimacy or the designer and to cover you both should anything happen.